To clear up what we're referring to when we say Southern or South of France, it's the area south of the Rhône and down to the sea and the bobbing boats of the Riviera where, viticulturally, the restrictions and minutiae of Burgundy and the Appellation Contrôlée system in general give way to a freedom around vine cultivation. 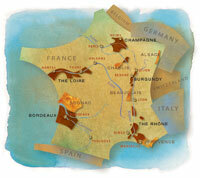 We pull in the south-west too, where there are more specific appellations - Bandol, Madiran, Cahors - but we're mainly concerned with Languedoc, where flowing rivers of Vin de Pays wines, labelled with varieties that the less well versed of us can understand and cultivated in the Provençal sunshine, blossom with bright flavours and approachable personalities. Many Vin de Pays are excellent, however let's not forget that there's the serious stuff too.